About 50,000 people have had their eyes firmly fixed on the skies above Plymouth Sound in Devon to witness a possible new world record. 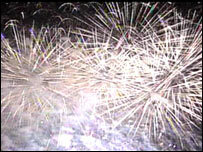 To celebrate the 10th anniversary of the British Firework Championships, more than 55,000 rockets were fired within a five-second period. The record attempt on Tuesday night was made by Dr Roy Lowry from the University of Plymouth. Guinness World Records will decide if a new record has been set. Fifteen specially-constructed frames laced with pyrotechnic fuses were ignited electronically to challenge the previous tally of 39,210 rockets set by Terry McDonald in the Channel Island of Jersey in 1997. Dr Lowry said: "We wanted to make sure the 10th anniversary was special and also I think this proves that science can be fun." He said he had been confident about the pyrotechnic side of the record attempt, although he had had some misgivings about the rainy weather. After the rockets were fired at 2130 BST, a safety gap of about 15 minutes had to be left before Prof Lowry and his team began the mammoth task of counting how many fireworks did not go off, in order to work out how many did. "All the evidence has to go off to Guinness in London now. They'll take about six weeks to look that over. "Hopefully then, they'll send us a certificate."